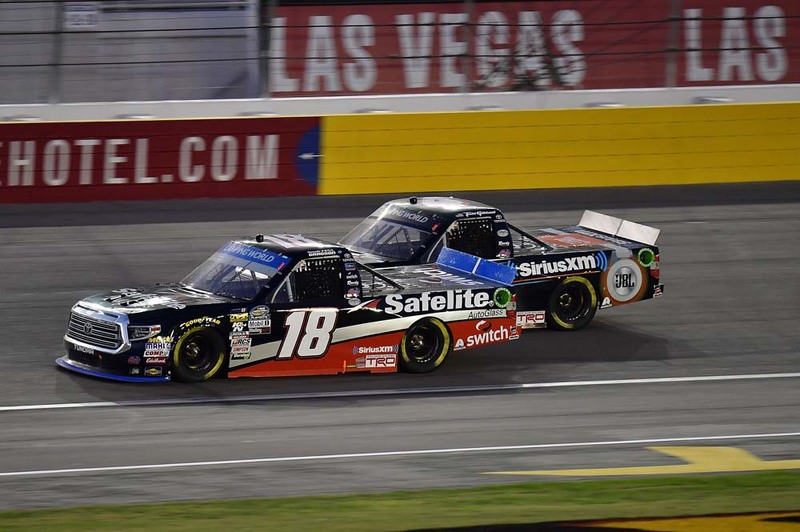 Noah Gragson captured his NASCAR Camping World Truck Series-leading fifth pole of the year and then led the first 33 laps of the World of Westgate 200 at Las Vegas Motor Speedway en route to his series-leading 10th stage victory of the season. The 20-year-old was in a position to win at his hometown track late in the race before another competitor’s truck crinkled his left-rear fender and a tire rub developed. Gragson would go on to finish in the 18th position and was able to hold onto the fourth position on the Playoff Grid heading into the final race of the Round of 8 at Talladega (Ala.) Superspeedway. He currently sits 23 points above the cutoff line for advancing to the Round of 6. After starting from the pole, Gragson would lead all 30 laps of Stage 1 to pick up his series-leading 10th stage win of the season. He finished 4.6 seconds ahead of John Hunter Nemechek who crossed the stripe second in the opening Stage. 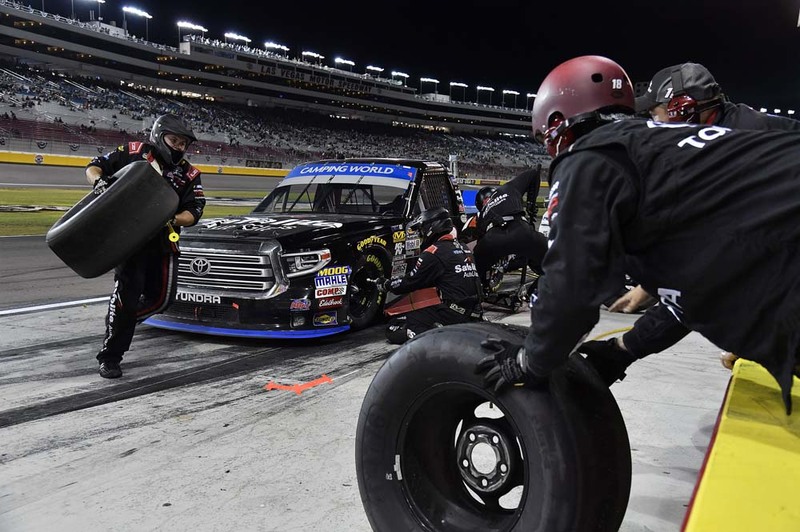 When pit road opened, crew chief Rudy Fugle summoned the Safelite Tundra to pit road for four fresh right-side tires, a trackbar adjustment and a full tank of fuel. Stage Two went green on lap 37 with Gragson scored in the second position, but by the time the field crossed the strip to complete lap 38 had subsided to the sixth spot. He was scored in the fourth position when a one-truck accident slowed the field for the third time on lap 46. He reported that the adjustments had snugged up his Toyota. The field when back green on lap 49 and the Las Vegas drive was able to advance one position to finish third in Stage Two. When pit road opened, Gragson brought the Safelite Tundra to pit road for a four-tire and fuel stop with a wedge adjustment. He returned to the track scored in the fourth position when the Final stage went green on lap 66. He was running in the runner-up spot, right on the bumper of Grant Enfinger, when a two-truck accident slowed the field for the fifth time on lap 83. Fugle summoned his driver to pit road for four fresh tires, a trackbar adjustment and a full tank of fuel. He returned to the track scored in the sixth position, but was the first driver with four fresh tires. As the racing intensified, the battles inside the top 10 were often three and four wide. Stewart Friesen spun just in front of Gragson to bring out the caution sixth caution of the night with 34 laps remaining. The Safelite Tundra was scored in the fifth position when the field went back green on lap 103. Gragson was in a four-wide battle for the fourth spot with 28 laps remaining when his teammate Brandon Jones and Brett Moffit made contact to his inside, which shot Moffit up the track into Gragson’ s left-front tire. The contact crinkled the fender of the Safelite Tundra and the tire immediately began to smoke. With 25 laps remaining Gragson was forced to pit road, but with the left-front tire flat he was unable to maneuver his truck below the commitment line and was issued a pass-through penalty. As he was serving his pass-through penalty, Friesen went spinning through the infield grass bringing out the ninth caution of the evening. Gragson hit pit road when it opened to continue repairs to the left-side damage. When the field went back green with 18 laps remaining he was scored two laps down in the 26th position. With 16 laps remaining he had an issue with the right-rear tire and hit pit road once again. After the over-the-wall crew put a fresh set of tires on, Gragson returned to the track three laps down. The No. 18 team was able to receive two lucky dogs as the race turned into a caution fest in the closing laps and would end the day with an 18th-place finish. How will you rebound for the final Playoff race of this round in Talladega? What happened in the race that caused damage to the left front of your truck? How strong was your Tundra prior to the contact? The race featured 11 cautions for a total of 47 laps. There were 21 lead changes among nine drivers. Gragson led once for 33 laps. He has now led at least one lap in all but two of his 17 starts in 2018 and continues to lead the Truck Series with 543 laps led on the season. With two of three races complete in the Round of 8, Gragson sits fourth in the point standings. With one race remaining in the Round of 8, he sits 23 points ahead of the cutoff line for advancing to the Round of 6. Gragson will be back behind the wheel of the No. 18 Safelite AutoGlass Tundra when the Truck Series resumes action Oct. 23 at Talladega (Ala.) Superspeedway. 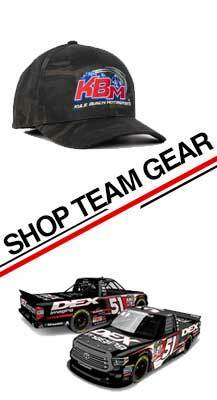 Live coverage of the NCWTS race begins Saturday at 1 p.m. on FOX.